Every National Day, Doggie Wardrobe would try to start a charity drive to aid needy fellowdogs! This year, we will be reaching out to help Mdm Wong's Shelter - A non-profit shelter for abandoned, abused and rescued dogs and cats. 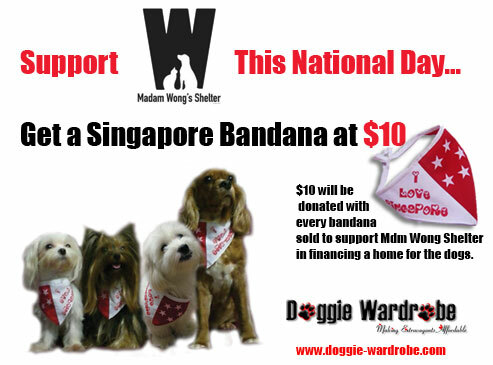 In this 2 months - July and August, Doggie Wardrobe will pledge our stock of limited edition Singapore Bandana to contribute to Mdm Wong Shelter, be it in rental, food or vet fees. Each bandana will cost $10 and all of the $10 will donated to the Shelter. (We encourage payment by bank transfer to avoid paypal charges) We will also pay for your normal mailing postage as part of our contributions in addition to the bandana! Your contribution, however small, will definitely make a difference to our Singapore Shelter dogs! Do pass on this fund raising event to your friends!